Array of coins at Laad Bazaar near Charminar. The cobbled alleyways of Hyderabad’s old city are an explorer’s paradise. While a tourist who is short of time may only marvel at the hollow dome of the Mecca Masjid or Charminar’s almost claustrophobic twisted stairways, an explorer is sure to chance upon something new with every visit he or she makes. Navigating the way through a sea of people at Laad Bazaar, one is bound to come across the three to four vendors sitting on the footpath with a variety of old and vintage-looking coins. They are hard to miss, sticking out like a sore thumb amongst all the glitz and glitter. With an assortment of coins that look like they range from the prehistoric era to the modern day cent, a seasoned collector would immediately notice that half of them are fake. Numismatics is one of the most coveted hobbies, especially in India, where so many dynasties have come and gone and left behind imprints with their currencies. 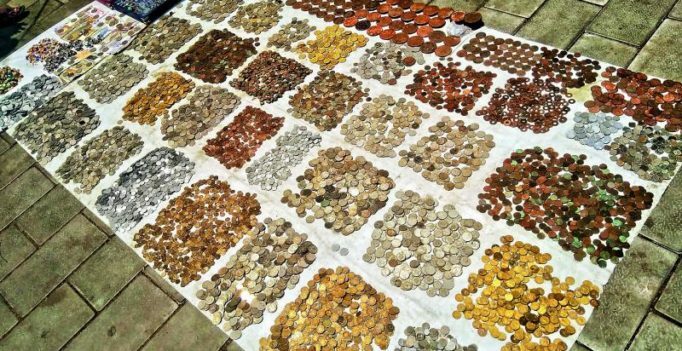 One of the city’s most well-known coin collectors and a Fellow of the Numismatic Society of London, Dr Muhammad Safiullah warns against the perils of fake dealers. “The ones at Charminar are definitely not trustworthy. Coin-collecting has over time, evolved from being just a hobby to an investment opportunity. A fellow coin collector recently sold a coin he had bought for Rs 5,000 for at least thrice the amount. Coveted coins are sold for anywhere between Rs 1 lakh to Rs 3 lakh. Therefore, it is very important to know what you are buying,” explains Dr Safiullah, adding, “Laboratory tests are of utmost importance because these coins keep changing hands at auctions. India has two very well-know laboratories where coins are tested, one in Delhi and the other in Mumbai. It’s called the Numismatic Guarantee Corporation of India. But how does an amateur coin collector differentiate between fakes and originals? “Experience is the only way to go. For a newbie, the only advice I can give is to start studying and examining coins around you. Check your pockets, your mother’s purse, look for loose change. Examine these contemporary coins and how they are different from each other, how the coins have changed over time. And always buy from a registered dealer,” sums up Dr Safiullah.